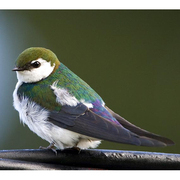 Common and densely distributed at lower elevations throughout Puget Trough counties in rural, suburban, and urban landscapes, where nests in tree cavities, provided nest boxes, and buildings. Also locally common in low- and mid-elevation riparian and residential areas in Kittitas County. Common breeder in Yakima Canyon and along Columbia River, utilizing basalt cliffs for nesting. 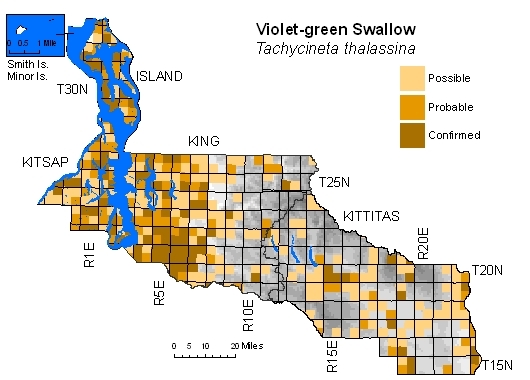 Penetrates Cascades along river valleys but uncommon and local in intact mid- and high-elevation forests, contra predicted range mapped by Washington Gap report (Smith et al. 1997). Phenomenal success in developed lowlands perhaps attributable to adaptation to human-built structures for nesting.